A few weeks ago, we told you that Chandra was going to start introducing video into our blog. We've done some minor dabbling so far, but now we're stepping it up a bit. Today we are posting our first attempt at what we're calling (at the moment) "Meet an Astronomer." The idea is to do a quick interview with a scientist to give a small peek into their world. Let's face it, scientists - and science itself - can seem a little off-putting. This hopefully will make both of those feel a little more accessible and personal. Where Does the "Harvard" Come From? As most of you probably know, Chandra is a NASA mission. But, like with children, it sometimes takes a village to raise a mission. In Chandra's case, not only did it take many individuals to make it a success, it has required many institutions and organizations as well. (For a more comprehensive list, see http://www.chandra.harvard.edu/about/axaf_mission.html) But one frequent question we get is: why do you have "Harvard" in your website's name? Read more about Where Does the "Harvard" Come From? This image of Centaurus A shows a spectacular new view of a supermassive black hole's power. Jets and lobes powered by the central black hole in this nearby galaxy are shown by submillimeter data (colored orange) from the Atacama Pathfinder Experiment (APEX) telescope in Chile and X-ray data (colored blue) from the Chandra X-ray Observatory. Visible light data from the Wide Field Imager on the Max-Planck/ESO 2.2 m telescope, also located in Chile, shows the dust lane in the galaxy and background stars. 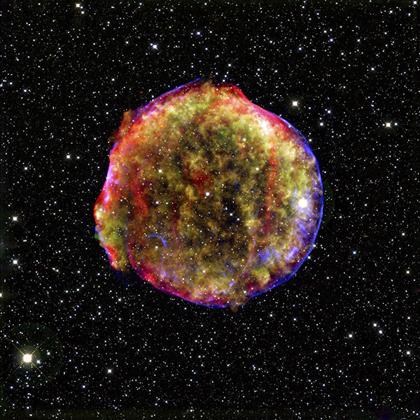 Enjoy new Chandra images recently added to the Flickr Commons SI photostream. 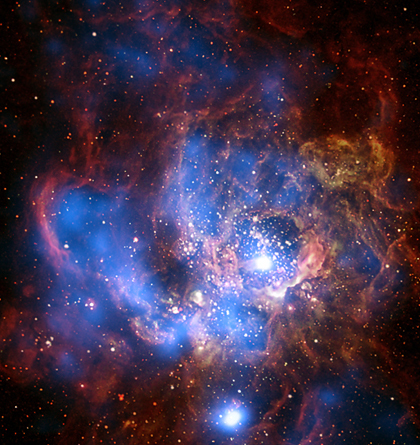 We keep an eye out for all things astronomical in the news - especially when the words "Chandra" or "X-ray" pop up. Over the weekend, we noticed a story about both of these things, but this time it had nothing to do with us! [First image of moon's Haworth crater] The result was from an Indian spacecraft in orbit around the Moon that sent back some X-ray data of the surface. The International Year of Astronomy 2009 (IYA2009) officially kicked off during opening ceremonies at the UNESCO headquarters in Paris, France, on January 15th and 16th, and Chandra was there to help.